Sign up to our Facebook Group for news about classes, taster sessions, and student information. Attend one of our taster sessions available all year round. Memberships are available for purchase from the SU Club page*. This should be done AFTER your taster session if you wish to continue. Teesside University Tae Kwon-Do Club (TUTKD) has been running and competing for over 5 years, and has become THE most successful martial arts club on campus. We have produced British, English, Scottish, Welsh and International Champions and many more medallists across the competitive arena, gaining over 100 medals in the past 4 years alone, and being ranked top #5 in the league tables is what we’re all about. We’re also the only martial arts club at TU that regularly competes at local, national, and international competitions throughout the year, giving all of our members one of the best competitive experiences that Teesside University has to offer – we also offer all our students who are ready and eligible to train, travel and hopefully secure selection to represent their own countries at European and World level. We currently have students training in ITF England and ITF Wales National teams. We are not all about competitions; we also have some of the best Grand Masters, Masters and Coaches regularly visiting and offering seminars and training sessions at TU as well as giving the opportunity when ready to become a qualified Instructor and Umpire if this is what you’d like to take out of our Taekwon-do club. Our Chief Instructor/Coach is one of the UK’s top instructors, a current International competitor and 2017 double European Bronze Medallist (competing for 22 years) Mr. Chris Black is an ITF 5th degree International Instructor, Umpire & Examiner. Unlike other clubs on campus, we offer you the chance to spar, defend yourself, get fit, and have fun, in a controlled environment, we have tailored classes to all levels, and hold grading’s throughout the year. Ranging from complete novices to international standard black belts, our club is open to all and classes are tailored to suit your level – complete beginners are always welcome! We train hard and offer fitness, strength, stamina, agility, flexibility and of course new skills – you won’t find another club like us! We work hard and play hard too – we have a dedicated social sec, regular socials and fun weekends away. We are an ITF (UKTA) club but welcome members from all associations and organisations, including WTF, GTUK, TAGB etc. The training and qualifications you gain with us are fully certified by the ITF (International Taekwon-do Federation) and are recognised throughout the World! Not everyone in the club competes – many people come along purely for the outstanding fitness and social atmosphere – so don’t worry if you’re not the competitive type! Just come along once or twice to see if this club is for you! People of all levels of fitness and skill are welcome to join us. We offer training for beginners to high level grades. Taekwon-do will increase your fitness, further your skills, provide you with discipline and increase your expectations of yourself more than you ever thought possible. We are a friendly group of people, and are very excited to meet new faces in the new academic year and we are FREE* all year to train, what have you got to lose? 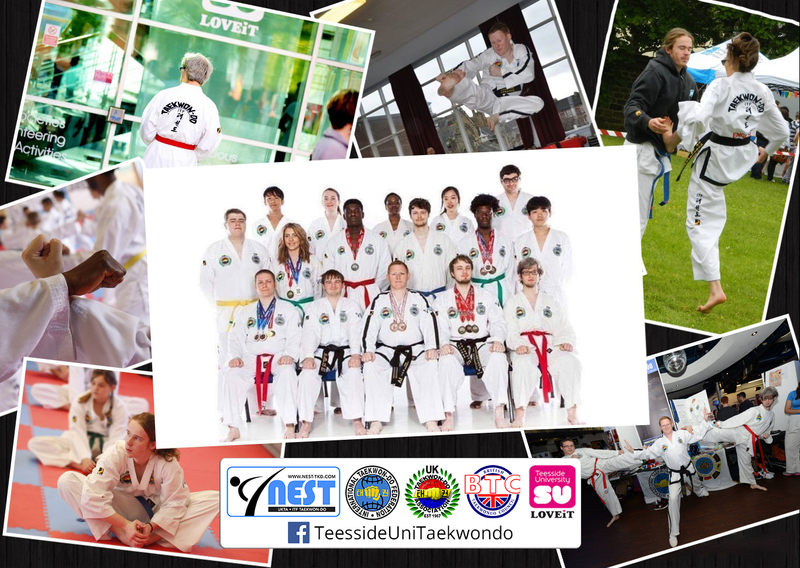 Teesside University Taekwon-do is part of NEST Taekwon-do Schools.